Principal investigator for the ORANGE Plus II Trial. This is a international multi-centre randomized controlled trial comparing the laparoscopic versus open hemi-hepatectomy. 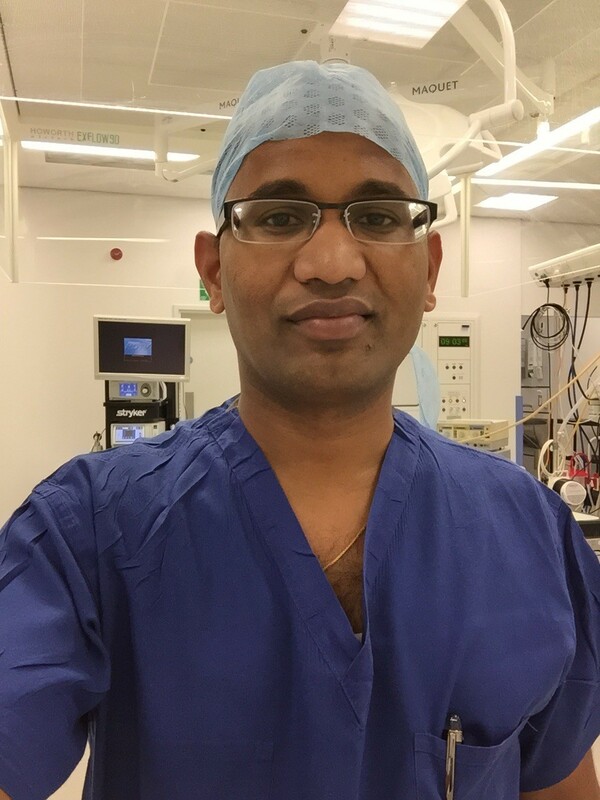 Our hospital is the second centre in the UK to be selected to take part in this trial as we are one of the major centre who perform laparoscopic liver resections. Involved in a multi-centre study comparing the survival difference between pancreatico duodenectomy (PD), PD with vascular resection, and surgical bypass in patients with resectable/unresectable pancreatic head carcinoma. Mr Guiseppe Fusai, Consultant Surgeon, and Royal Free Hospital initiated the study. I have obtained local R & D approval for this study and provided all the necessary data. The comparison of MELD and UKELD scores as predictor for death on the transplant waiting list: This is a retrospective study of 524 patients who were added onto the Liver Transplant waiting list since October 2005. The aim of this study was to examine the predictive accuracy of MELD and UKELD scores in predicting the waiting list mortality on the waiting list for liver transplantation. The results of this study showed that UKELD is a better predictor of waiting list mortality than MELD. This work was accepted for oral presentation in the XXIII International Transplantation Congress meeting at Vancouver, August 2010. The cost-effectiveness of Mycophenolate Moeftil (MMF) and low dose Tacrolimus (MMFT) based immunosuppressive regimen compared to Azathioprine and Tacrolimus (AZAT) based regimen following Orthotopic liver transplantation (OLT): The aim of this study was to compare the inpatient healthcare expenditure associated with MMFT and AZAT regimen following liver transplantation. The results of this work were presented in British Transplantation and International liver Transplantation Society meeting. The paper was submitted for publication in the Liver Transplantation journal. MD (Doctor of Medicine): I completed two years of full-time research between August 2002 and July 2004 under supervision of Professor Patrick Johnston and Mr Declan Carey at Northern Ireland Regional Cancer Research Centre, Belfast, UK. My research entitled “Identification of predictive markers of response to chemotherapy used in the treatment of human gastrointestinal cancers”. I was awarded MD in 2005. Some of my research work was published in the Clinical Cancer Research journal. MS (Masters in Surgery): I have also completed a period of research and was awarded MS from AIIMS, New Delhi, India. My research entitled “Evaluation of the role of Neoadjuvant Chemotherapy using low dose 5-Fluorouracil (5-FU) and cisplatin in squamous cell carcinoma of the oesophagus” commenced in May 1996 for a period of two and half years. My research work was published in Indian Journal of Cancer.